Luckily technology and a shifting investment landscape have opened up many possibilities for the man on the street to get into the property game without needing serious funds. The easiest way is to invest in property-backed loans on a platform like EstateGuru. You get to choose which developments and projects you want to back, build a diversified portfolio across a variety of projects and countries, and reap rewards much faster than possible through traditional property investments. Many people never even consider getting into property due to a pervasive set of myths that cloud this traditionally safe and profitable asset class. The rise of the Peer to Peer property portal has served to counter these myths rather successfully. The days when you needed a major cash deposit to secure a loan and purchase property are long gone. By investing in someone else’s development project through a peer to peer loan you gain the benefits of property profits for as little as €50. The traditional approach to property investment is to buy at market value, use rental income to supplement bond repayments, and hope for long-term appreciation. While this is a legitimate strategy, it does take many years to realize a profit. By investing in a property-backed loan, you reap your rewards in as little as 12 months, meaning you can take advantage of the security offered by property without the long wait. 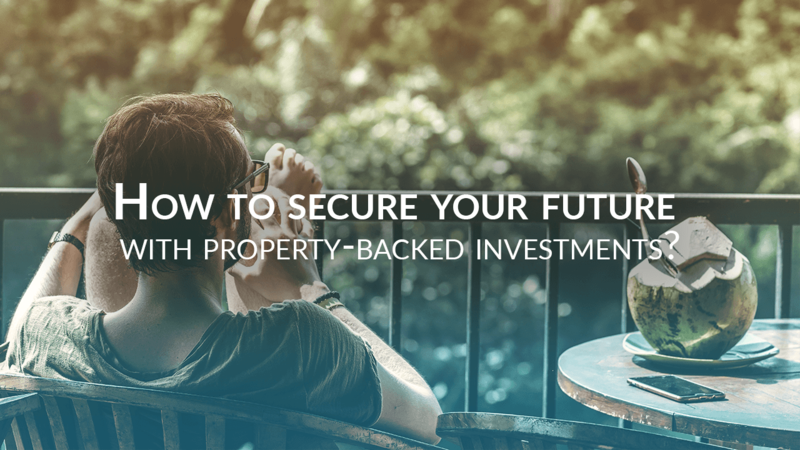 The secret to using property-backed investments to secure your future is fourfold. You need to start out by asking yourself what it is that you want to achieve and by when. Research shows that people who set these firm targets and deadlines enjoy more success in their investments and show greater discipline when it comes to sacrificing in the present for future rewards. What is it you want to achieve? Early retirement? Financial independence? The freedom to pursue your passion without money worries? Now think realistically about the timeframe and exactly how much you will need to achieve your goals. Check out our guide on how to start investing to get some useful tips on how to get started. While it is never too late to get started, the sooner the better remains a truism. The beauty of short-term, property-backed investments is that they offer great security, excellent returns, and short-term results. Unlike traditional property investment with a mortgage and 15-20 years of repayment, you’ll start seeing results after as little as 12 months. One of the biggest challenges faced by first-time investors is delaying gratification. The urge to dip into your profits early is hard to overcome. The high liquidity offered by P2P property-backed investments may make this temptation worse, but it offers a direct benefit in opposition to this temptation. It’s really easy to reinvest both the principal amount and your profits, and this brings with it exponential monetary benefits. Investing in any form is a balancing act between risk and reward. If your investment is a tightrope walk between these two, the platform you choose is the rope. Make sure that the platform you choose has a proven track record, complies with cyber-security standards, is staffed by experts in their field and explains their structure and investments in a fully transparent manner. All investments, including real estate, are speculative in nature and involve substantial risk of loss. We encourage our investors to invest carefully. We also encourage investors to get personal advice from a professional investment advisor and to make independent investigations before acting on information that we publish.